“This might just be me, but I don’t need jam on my dinner. Yes, turkey is a dry meat, and yes sometimes a bit of sweetness can perk up a dish, but there isn’t any call for it with Turkey. Nothing is enhanced by this overwhelming sweetness. And that’s fine, this has never been a huge issue in the past because it is a sauce, it is not compulsory and so the Ocean Spray can stay away. obviously this^^^ is a question worth asking — we shd pursue it in the upcoming days! Do any festive sangers have gravy? But cranberry is good not bad. it is not really a moisteriser and it is by no means new (it was probably inherited from the days when a fancy xmas was goosed-based — you need something nicely tart and acidic to cut through the goosefat). also sweet and savoury on the same plate is classic pre-modern pagan cuisine (and the wobs sanger is nothing if not a pagan strand of our cultural life). if we’re going to insist on unwonted xmas-feast changes, end Fanny Cradock’s satanic reign and bring back goose!! GOOSE!! That awful festive jam ruins almost all Christmas sandwiches. It wasn’t always thus – the plague has spread over the years. From memory, I think that last to give up was the Upper Crust, who used to have gravy rather than the red evil in their seasonal offering. The problem for me is quantity not presence. As the Ape says, it’s a cheap option to plump out a sandwich, but you want hints of sweetness (or of tartness I SUPPOSE) not a great big layer of it. Better some than none, though. I love bacon in its right place, but the dry, cold, congealed bacon in pre-packed sandwiches is an absolute disgrace. I’m afraid that ten years in East Asia has convinced me that cold sandwiches in the winter is some kind of British Stockholm Syndrome thing, and will consequently never try a Christmas sandwich, for better or worse. 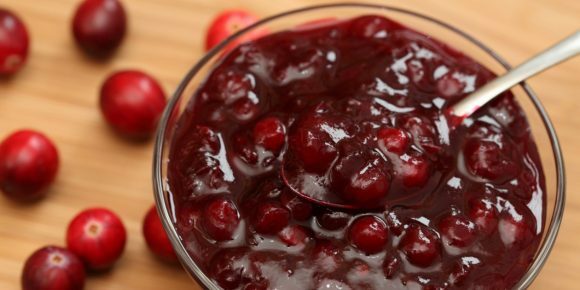 Cranberry sauce sounds pretty good fwiw. Oh, and my summertime quest to try every different coronation chicken sandwich resulted in a second-from-bottom placing for the unutterably bland M&S effort (though it was still better than the one I got from Morrissons which gave me food poisoning and, even worse, had chopped green peppers in it) so not sure why they still have any kind of sandwich-making reputation at this point.